What Is Causing Your Bad Breath? National Children’s Dental Health Month is observed every February to promote awareness about the importance of good oral health. Together with the help of a pediatric dentist in Willow Grove, a few basic habits will keep your kids on the right track. It is recommended that you brush your teeth at least twice daily for two minutes at a time. Look for fluoride toothpastes with the American Dental Association (ADA) seal, which will help to remove plaque from teeth and gums. Don’t forget to brush your tongue, which is a target for bacteria that cause bad breath. Use dental floss to clean between your teeth at least once a day. This will remove plaque from areas that your toothbrush cannot reach. Children will likely need assistance with flossing until they are about ten years old, at which point they should see a pediatric dentist, who will demonstrate proper technique. What you eat plays a big part in your oral health. Avoid sugary snacks, which can lead to tooth decay. Also limit acidic foods and beverages, such as soda, which are abrasive and can erode tooth enamel. Opt for foods rich in calcium and protein, which are instrumental in fortifying and rebuilding enamel. From when their first tooth appears, children are advised to visit a pediatric dentist approximately every six months for a checkup. Even if all of the above habits are adhered to, these visits should not be neglected. The dentist will perform a more thorough cleaning than is possible at home. He or she will also be able to spot any signs of disease or other problems, so that they may be treated at an early stage. Preventive care is the cornerstone of dentistry, so it is imperative that children develop good dental habits from an early age to prevent damage and costly procedures later in life. For further information and for treatment, find a pediatric dentist in Willow Grove. 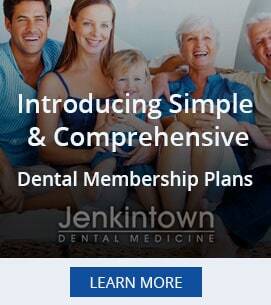 At Jenkintown Dental Medicine we practice a full scope of general and cosmetic dentistry with expertise ranging from porcelain veneers to dental implants, crowns and bridges. Drs. West and Wilk can now correct a wide variety of so-called permanent cosmetic dental problems, and can literally redesign your smile. We offer free consultations, personalized attention, and customized solutions for your dental needs. With a combined total of 30 years of experience, Dr. West, and Dr. Wilk will create a dental implant solution that will cosmetically correct your issue. Jenkintown Dental Medicine has already implemented dental solutions for your neighbors in nearby communities like Horsham and Abington. Call your Willow Grove Pediatric Dentist at Jenkintown Dental today at 215-885-6565. Should I Choose Dental Implants or Dentures?